Underground History - 1929 map & Commercial Breakdown! 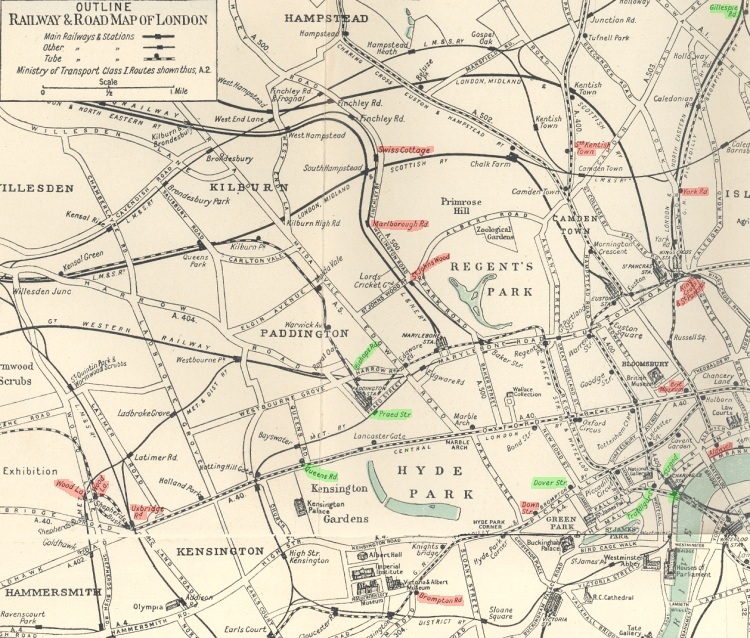 Detail of a map published in A Pictorial Descriptive Guide to London, published in 1929 by Ward Lock & Co. Ltd.
Stations highlighted in red denote Underground stations that have closed since this map was published. Stations highlighted in green denote stations that have been renamed. The original map was monochrome with the exception of lakes and the river Thames being coloured light blue. At first glance, it's easy to see why this style of map was soon to be replaced by Harry Beck's famous Tube Map. This map is quite difficult to follow (although maps did exist at this time with the various underground lines colour coded, they were all geographical representations like this one). We're used to calling any underground line "The Tube", but notice here that it is only the deep level lines that are denoted as "Tube" in the key. The cut and cover lines are classed as "other" along with some other commuter services (some of which have since gone). An interesting anomaly on this map is the inclusion of South Kentish Town, which had already been closed for five years when this map was published. Since most of the stations that closed in central London closed within a few years of this map being published, I started thinking about the advertisements that were included in the book in which the map was published (which served as a "Rough Guide to London" of its time!). Many of these advertisements would have been seen adorning the walls of Underground stations, so I include some of these here for your amusement and also some information about the companies being advertised if I've been able to find out something about them. Note: I don't endorse any of the companies being advertised nor have I (obviously) received any payment for their inclusion. Any links to the companies featured are purely for reference (with the exception to the charitable organizations, which I encourage you to support if they still exist today). 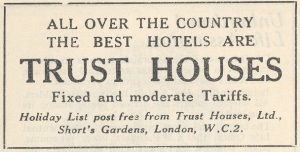 The publication in which these advertisements were found was predominately a travel guide, so obviously people with travel in mind would be advertising in it! Ok, I'll level with you, I have NO IDEA what this advert is for, but I can speculate! It looks like they're selling some form of guide to use on a bus tour based on the description and the fact that a few of the happy people are reading something. 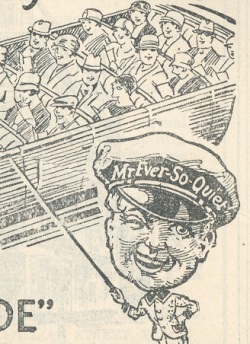 I must admit that I find Mr Ever So Quiet, with his massively disproportionate head and pointy stick mildly disturbing for some reason, but you have to admit, all the people on the bus do look very happy! I have searched high and low (OK I used Google) to find out what exactly the Scenaidicator is, but alas, my search was fruitless. Update: Since publishing this page, a few people have gotten in touch with me explaining what this is all about. Essentially, if I understand it correctly, the Scenaidicator was a special guide book with numbered items. As the driver drove past certain locations he would pull a switch which would light up a bulb on a panel down the front of the bus, illuminating a number. 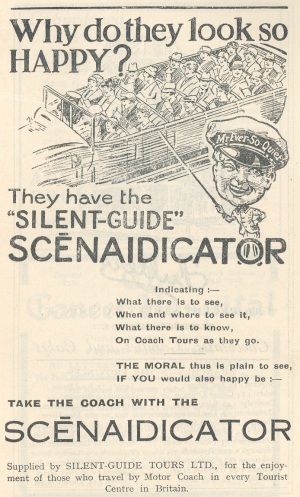 The "silent guide" meant that you would then read the information corresponding to that number, therefore eliminating then need for a guide. Oh, the good old days, when you could take a steam boat ride down the Thames, without a care in the world... wouldn't it be wonderful if you could do this today? Hang on - you can!! Salters Steamers are still doing exactly the same as they were in 1929 - running steam boat trips on the Thames! 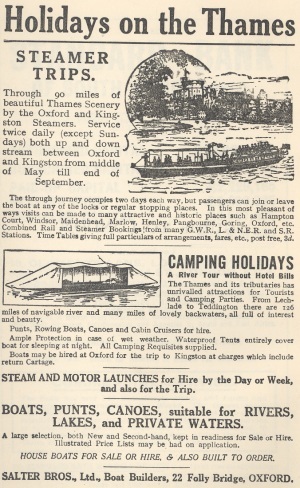 I don't know if you can go on a camping holiday with them today, but there are daily excursions running between Oxford and Staines. Several people have contacted me confirming my suspicions that these were bought by the Forte chain and became Trust House Forte, who run the Travellodge hotels around the UK. I enjoy looking at and collecting maps, especially old ones. Any map collector would recognize the Bartholomew brand because unlike many of the other map making companies who were making maps in 1929, Collins Bartholomew as they are known today are still very much in the business of making maps. 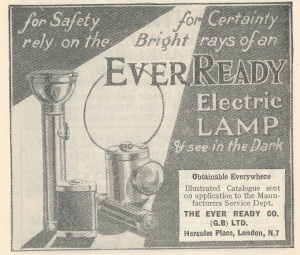 Eveready are well known today for making Energizer batteries, and here in 1929, they were advertising the sale of lamps and torches. They actually still make and sell flash lights today under the Energizer brand. I can still remember when they made batteries under the Eveready brand - they were featured on Blue Peter "Make" projects that required batteries. As advertising or product placement wasn't allowed on BBC programmes, black tape was placed over the actual name Eveready on the logo - but the rest of the logo was plain to see and we all knew that they were Eveready batteries! Update: I've recently seen batteries on the shelves under the EverReady brand, so the brand is still alive and well. Here's one that I've found surprisingly little about on the internet, yet seems so familiar. I do seem to remember liking Fuller's chocolate, many years ago, but I haven't seen it for years. The same company? 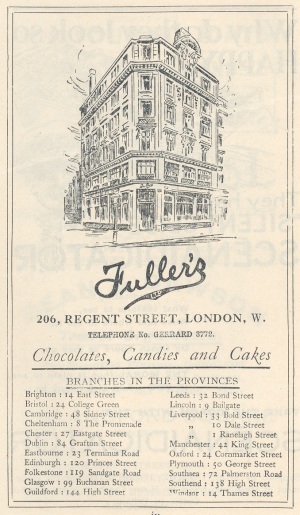 there was also a chain of tea rooms named "Fuller's" which specialised in cakes & chocolates - I guess this is what is being advertised here. Stuff that makes you go "eh?" What can I possibly say about this one that won't detract from this gem? It cracks me up every time I read it - I think an accompaniment of a jaunty tune with the words being read in prim queen's english, much like the news reels that were being shown in cinemas, years ago would suite this ad. 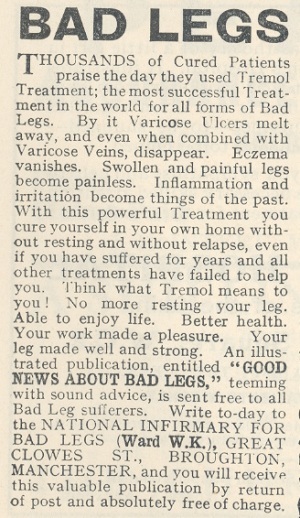 An illustrated publication entitled Good Things About Bad Legs. It must have been a cracking read! I couldn't track anything else down about Tremol Treatment - it's got nothing to do with the Italian company which now uses the trademark Tremol. 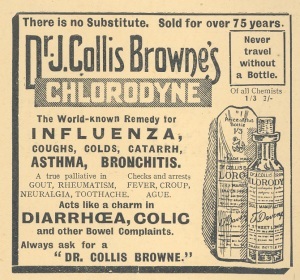 Dictionary.com describes a chlorodyne as a patent anodyne medicine, containing opium, chloroform, Indian hemp, etc. An interesting collection of chemicals that you can't really be selling unprescribed today I'd have thought. This product can't possibly have survived the time line between 1929 and today. Can it...? WRONG!! I must admit I'd never heard of this product before -here's what Net Doctor has to say about it, which can be bought off the shelf without a prescription, thankfully now in a more palateable pill format and it also looks like they've made "slight" adjustments to the formula! Update: About a year after writing this, I wasn't feeling too well so I went to the pharmacist for advice. I was offered a bottle of Doctor Collis Browne's - it's still alive and well in liquid form too, though I suspect the formula is different. I'd never heard of coal tar soap - I suspected that this kind of product wouldn't be available today - but once again I'm mistaken! 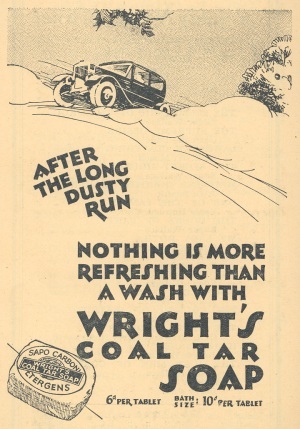 You can actually buy Wright's Coal Tar Soap today, though these days it's called Wright's Traditional Soap (with coal tar fragrance) - European directives have since banned the actual use of coal tar in any non-prescription products, with tea tree oil now being the main anti-bacterial agent. There were quite a few advertisements for charitable organizations in the publication. Amazingly almost all of the organizations who advertised in this 1929 book are still running today! 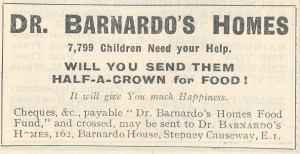 Dr. Barnardo's Homes were an organization who provided homes for orphaned children in an age where the children would otherwise have been abandoned on the streets. Today known as Barnardo's, they no longer run children's homes, but now have a much wider mission to help children in need. A very worthy cause. 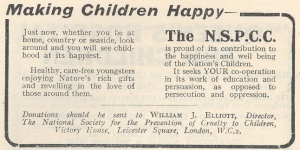 NSPCC stands for National Society for the Prevention of Cruelty to Children, and is very much active today, directly protecting children from cruelty. Another organisation that's very much alive and kicking today. The Church Army are an organization founded by Revd Wilson Carlile, and share the Christian faith through words and action and equip others to do the same. 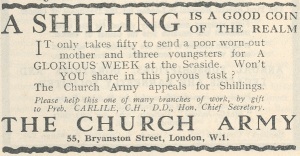 A shilling is worth 5 pence in today's money so the amount being suggested as an appropriate donation in this advert is £2.50. In the UK, we take for granted that our hospitals are funded by the National Health Service. Before the NHS came into being, hospitals were supported either by charging the patients a fee, or by charity. 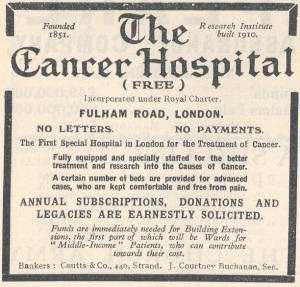 Many hospitals even today rely on charity to fund both the purchase of essential equipment and for valuable research. The Cancer Hospital on the first ad. became The Royal Marsden, today world famous for their research into Cancer treatment. 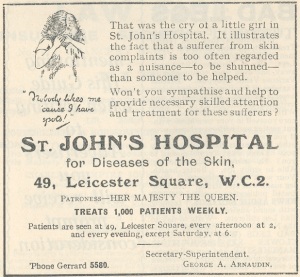 St. John's no longer exists as a separate hospital on the premesis shown in the advert, however, St. Johns still exists as a specialist wing of Guy's & St. Thomas' hospital, specialising in skin care. The Queen's Hospital has gone through various stages of reorganisation since 1929, and I believe it is now part of East London Hospital for Children and Dispensary for Women. 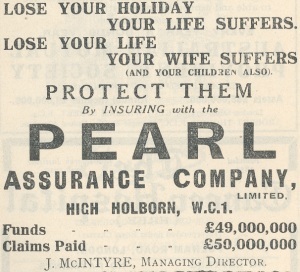 Just as today, insurance companies used interesting tactics to get your money. Wow, what an advertising slogan! This advert reveals a little about the work culture of the time. The advertisement is aimed predominately at the man of the house - this is because in all probability he would be the sole wage earner. Pearl are still with us today, though their advertising style is a tad more subtle these days! I don't think the Advertising Standards Authority would allow any financial organisation to claim that they were "Absolutely Safe" these days. 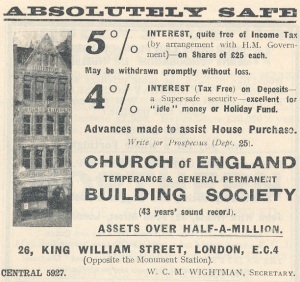 The Church of England Temperance and General Permanent Building Society invested money in "ethical" companies. In other words, no money was invested with breweries, distillers etc. I don't know the status of this society today - the Church of England Building Society, which I think was different from the one in the advertisement eventually became the Nationwide Building Society. This advert has another point of interest. The address given is literally doors away from the original location of King Williams Street station's surface entrance - already gone nearly 30 years when this advertisement was placed. All material on this page is © 2001,2004 Hywel Williams unless otherwise noted.